Here’s some good deals on the Eleaf IStick Power Nano Mod or get the kit with Melo 3 Nano atomizer tank. 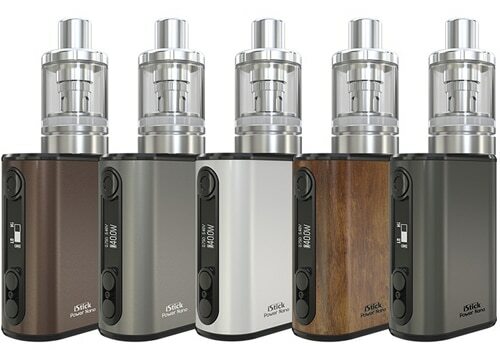 The Istick Power Nano is the latest portable box mod from Eleaf. It features 40W of output power, an 1100mAh internal battery, temperature control and is tiny. The Nano is made from zinc alloy, features amazing engineering and is very compact. With dimensions of only 13mm x 55mm x 38mm, it is amazingly small & light, making it an ideal mod to take with you on the go. And, you can get it in various colors including bronze, grey, white, wood grain or brushed silver. The device is built with an internal 1100mAh battery which is charged via the USB port on the bottom. With the included cable, you’ll achieve 1A charging. The mod may be tiny, yet it is very efficient to achieve good vapor production. The maximum output is 40 watts and its technology allows for temperature control up to 315 Celsius in nickel, titanium stainless steel and TCR modes. There’s also three memory slots to save your favorite settings. Atomizers can be fired if their resistance is above 0.05Ω in variable temperature modes or 0.1Ω in bypass, power and smart modes. And, the unit is constructed with dual circuit protection on both the software and hardware level. At the top of the Istick Power Nano, you will see a 510 spring-loaded connection that is made with stainless steel threads for longevity and maximum atomizer adaptability. The control face sports a large fire button and two regulation buttons. They encircle the OLED screen which displays resistance, voltage, temperature, battery level, mode, etc… on a two-line menu. If you decide to get the iStick Power Nano kit, you’ll also receive a Melo 3 Nano sub ohm tank. It is very small so it is a perfect combination with the Nano mod. It has a diameter of 22mm, a height of 52.5mm and features a 2ml e-liquid capacity. Removing the top cap allows for easy refills through the top. An airflow control ring on the bottom is adjustable and is hidden to allow the Melo 3 Nano a more fashionable appearance. The entire unit can also be easily disassembled for cleaning and maintenance. Inside the Melo 3 Nano, you will find Eleaf’s brand new ECML coil head which works at a resistance of 0.75Ω. It should be used for mouth to lung vaping and is said to produce a very flavorful vape.